In 1988, I finished a concentration in pre-med studies at the State University of New York at Buffalo. By this point, I was disenchanted and decided against the career because of varied issues surrounding the practice of medicine, especially in the US. These issues included the ethics of human and animal research; the rationalization and fracturization of the body underlying western medical understanding of the body; and the exclusive health care system of the US which the majority of its population cannot afford. Items 1-2,000 collapses western medicine's fracturization of the body with industrial itemization techniques into the ultimate rationalization apparatus. A human body is half submerged in a block of wax, in a manner reminiscent of how biological specimens are fixed in a "microtome" (a machine which cuts these wax embedded specimens into slices often as thinly as 1 millimeter.) A sheet of glass rests several inches above the figure in a manner analogous to that of a cover slide used atop the cross sectional slices in microscopy. This glass is affixed with barcodes, running transversely across the glass, which correspond to internal organ locations of the figure underneath. 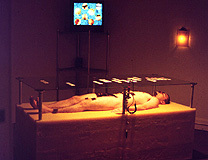 Participants interact with the work as anatomy students would a cadaver: They use a stainless steel barcode scanner much like a scalpelÑslicing horizontally across the figure to reveal the hidden target organ. The more familiar use of barcodes and scanning procedures however are not lost, and this surgical role blurs with that of cashierÑcommodifying and extracting value through the denial of the body as whole (rather a rational composite of itemized parts.) 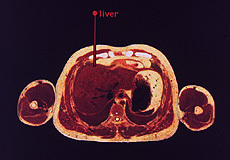 Each targeted anatomical region has an axial, transverse and saggital center, so that once the program accesses the correct axial slice, an arrow points to the correct x and y location within this Cartesian corpus. Every third scan the participant makes accesses a jarred recollection from my own experiences as a student in the anatomy morgue. These recollections are somewhat poetic and primarily address the phenomena of de-humanization of the corpse as it is de-constructed and subsequently re-configured through dissection. These musings attempt to de-construct the rationalization processes of western bio-medical practices and to discover a point of empathy with the subject. The recollection movies I have created from varied image sources. Most of the overlaid, diagrammatic components are taken from anatomy student dissection manuals; other elements are scanned from my own sketchbooks (In 1988, near the end of my pre-med studies, I would often return to the anatomy lab after hours to make pen and ink drawings of the corpse); while others utilize other medical data sets which I have de-convolved using specialized bio-medical software such as Analyze, running on Unix workstations at Pittsburgh's Science and Technology Center. I have also used a Scanning Electron Microscope to create certain close-ups, which are used in the final recollection movie clip. 1. I'm referring primarilly to Foucault's Discipline and Punish text -- Michel Foucault, Discipline and Punish., 2nd ed. trans. Alan Sheridan (Random House Inc., New York, 1994).